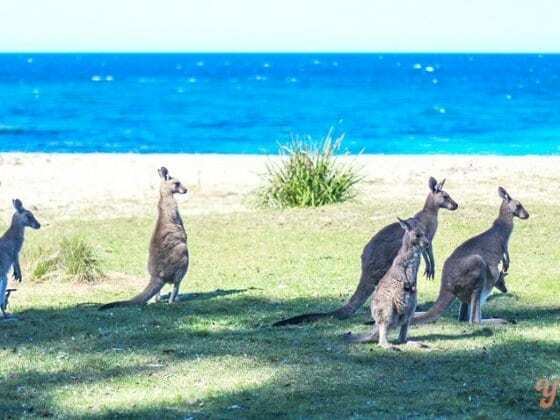 We get a lot of emails from our readers who want to visit Australia but they only have a few weeks vacation time and so ask our advice on where to go and what to see in Australia. 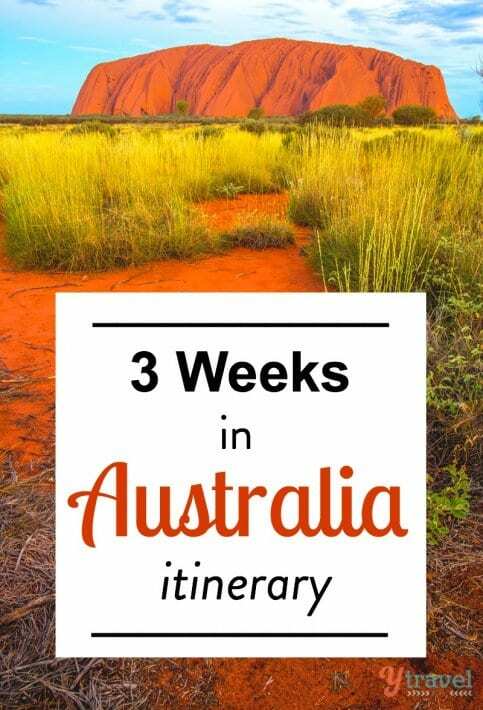 This post how to travel Australia in three weeks will answer a lot of their questions. If this is your first time planning a trip down under, these are the places in Australia I would suggest to see the highlights and make the most of your time traveling in Australia. During our road trip around Australia we met a lot of people visiting Australia for a short period, most of them on a tour. If you prefer to travel independently like us, travel is a big industry down under and it’s easy to go it alone. I’m going to suggest a list of places to visit in Australia, how long to stay in each location, what to see and do, even where to sleep at night. I’ll take a lot of the guesswork out for you. 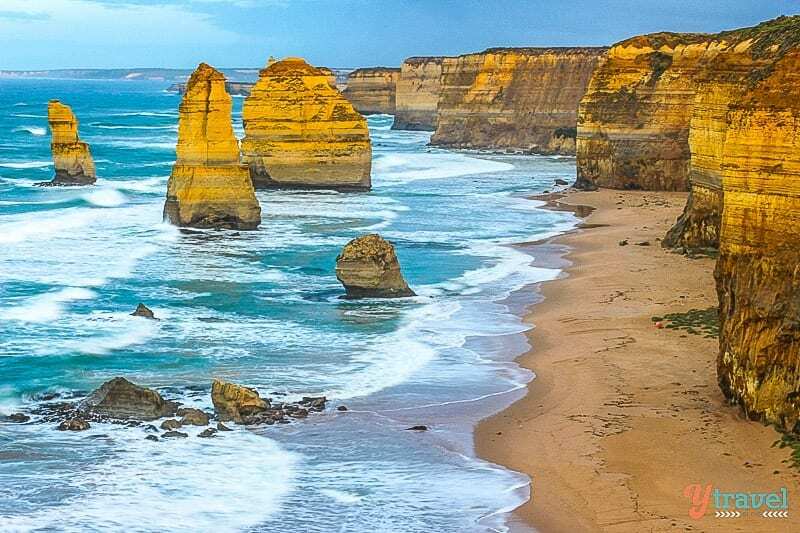 If you follow this three week Australia itinerary, you’ll get to visit Australia’s two best cities, Sydney and Melbourne, the Great Barrier Reef, the Daintree Rainforest, Uluru, the Outback, see wildlife, and the Twelve Apostles on the Great Ocean Road. Of course, I have to leave out some amazing places like Western Australia and Tasmania. It’s just not possible to do it all in three weeks! I understand the desire to see as much as possible, particularly if you are visiting from the USA where most of you only have a standard two-week vacation. But Australia is a vast country, almost the same size as the USA. Can you imagine doing all of the US in three weeks? It’s impossible, especially when you add in flying and driving times. The following itinerary is not set in stone, please use it as a guide and adjust it to suit your needs, time frame and budget. Take what you like, and leave the rest. Besides being Australia’s largest city, there are many reasons why Sydney is also the most visited. The stunning harbourside location, the iconic beaches, excellent restaurants, fantastic cafes and pubs, world heritage sites, terrific shopping, incredible festivals, a multicultural population, and good year round weather. So don’t just use Sydney as a gateway to Australia, with so much to see and experience give yourself three days. Trust me, Sydney won’t let you down. Hop on the Sydney Airport Link Train which takes 15 minutes (adult $17, child $14). Get yourself an Opal Card which is a smart card you top up so that you can pay your fares on trains, buses, ferries and light rail. Or, catch an Uber. (Use this code if it’s your first time to grab a free trip ql3dc). Once you’re in the city, I suggest you book your accommodation in the Sydney CBD so you’re centrally located to make the most of your visit, and several of Sydney’s highlights can be taken in for free or cheap simply by walking around. Walk around Circular Quay – The best place to start your visit is in Circular Quay, the main transport hub of Sydney Harbour and where two of Australia’s most famous landmarks reside; Sydney Opera House and Sydney Harbour Bridge. Consider taking a 1 hour tour of the Opera House. Otherwise, just wander around and take your “I was here” photo. Royal Botanic Gardens – you can’t beat the serenity and harbour views from these gardens. Have a picnic or take a walk and admire the many different types of plants and city views on a free self-guided walking tour. Explore The Rocks District – The Rocks District is a historic area of Sydney and my favourite part of the CBD. It’s home to Sydney’s oldest pubs, cobblestone streets, weekend markets, and views of the harbour. Climb the Sydney Harbour Bridge – climbing one of the most famous bridges in the world is a once in a lifetime experience. Take either a dawn, day, twilight, or night climb and take in the breathtaking views. (Book well in advance). Walk across the Sydney Harbour Bridge – a cheaper option than climbing is to simply walk across for FREE and take in the same views on a lower level. Or visit the Pylon Lookout for $11 and get fantastic views plus 3 levels of exhibits to learn about the history of the Bridge. 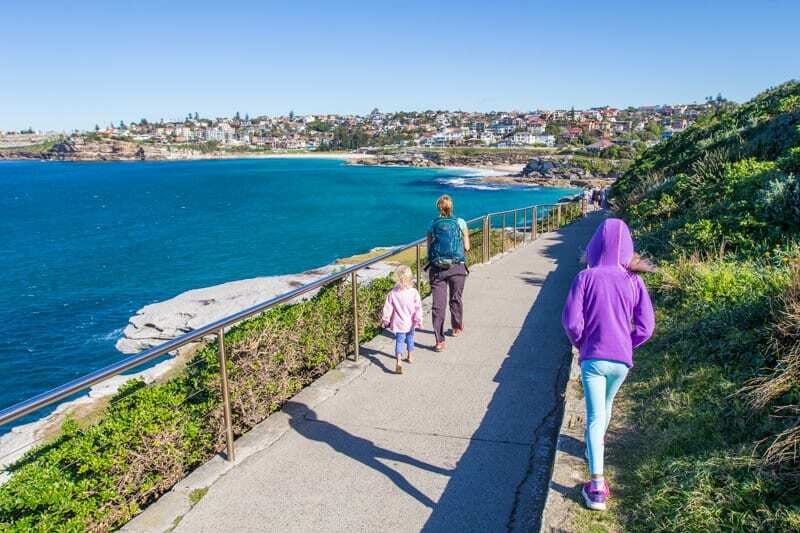 Bondi Beach to Coogee Coastal Walk – one of my favourite free things to do in Sydney. A stunning coastal walk and the perfect way to spend a gorgeous few hours in Sydney. 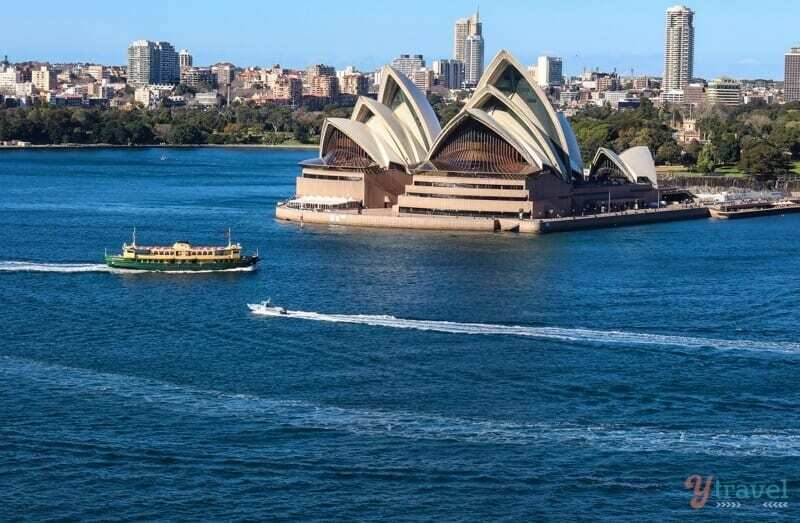 Catch the ferry to Manly – a cheap way to experience beautiful Sydney Harbour with stunning views of the city is to catch the ferry from Circular Quay to Manly and back. In Manly, walk down the palm tree-lined Corso towards the beach for an ice-cream, walk around to picturesque Shelly Beach, or grab a cold beer at Manly Wharf Hotel. Time your return ferry trip back to the Quay to coincide with the sunset behind the harbour bridge. Surry Hills – walk around one of Sydney’s most artistically-vibrant neighbourhoods with old terrace homes, a great mix of cafes, restaurants, wine bars and pubs. Wander Crown Street, Bourke street and Cleveland streets. Walk through Hyde Park – Australia’s oldest park and the city’s central open green space. The park contains St Mary’s cathedral plus numerous monuments and statues, and the central pathway through the park is an impressive fig-lined road. Hit the beaches – Sydney is famous for its beaches, which are great free things to do in Sydney. From the Northern Beaches to the Eastern Suburbs you have many great beaches to explore. 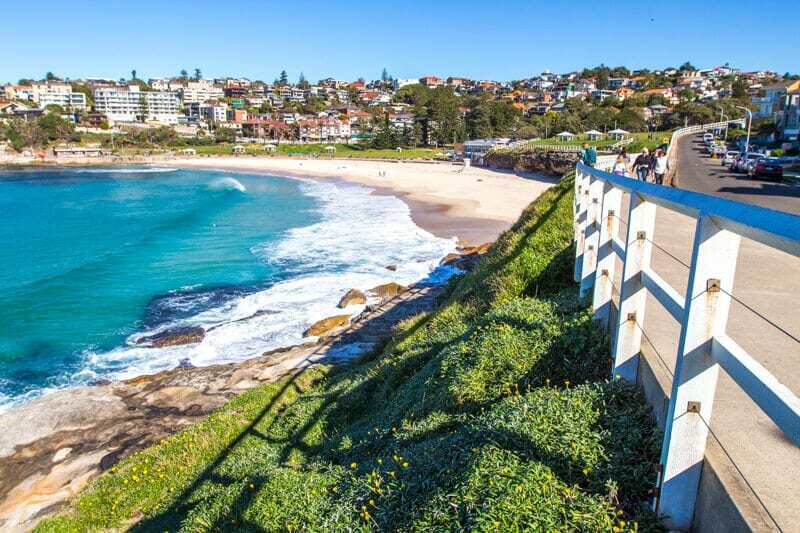 Our favourites: Bronte and Coogee in the eastern suburbs – and you must visit famous Bondi Beach at least once. Manly, Freshwater, and Palm Beach on the northern beaches. Taronga Zoo – Catch the ferry from Circular Quay to Taronga Zoo which is situated in a natural bushland setting with spectacular views over the harbour. A wide variety of Aussie and international animals with keeper talks and animal encounters makes for a great half-day as a family outing. Get your tickets here. Sydney Tower – for $18 go up to the top of Sydney Tower, the city’s tallest free-standing structure standing at 309 m (1,014 ft) above the CBD. It has an observation deck with awesome views of the skyline. Get your fast track entry ticket here. Art Gallery of NSW – free to enter and one of Australia’s leading art museums with collections of Australian, Aboriginal, European, Asian and contemporary art. Sydney Harbour YHA – in the Rocks! We are affiliate partners of Booking.com and RentalCars.com (we believe they’re the best). If you book through the links on this post we receive a small commission at no extra expense to you! Catch a flight from Sydney to Cairns (3 hour flight) and check into your accommodation in Cairns city so you’re nice and central. As one of Australia’s biggest tourist towns and gateway to the Great Barrier Reef, Cairns is vibrant with plenty of restaurants and cafes to keep you happy. The weather is typically amazing, you can walk around at night and have plenty to do, and the days are filled with an enormous amount of choice to explore the surrounding regions. Whilst Cairns is mostly about getting out on the Great Barrier Reef, the surrounding hinterlands and nearby rainforest are definitely worth exploring. 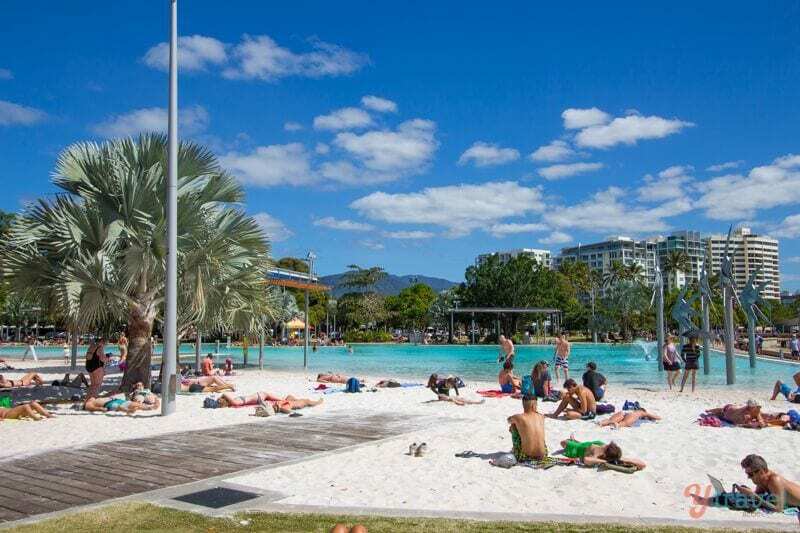 Swim at the Cairns lagoon – the cruelty of the north is you get hot summers but you can’t swim in the beaches, they’re full of stingers (jelly fish that can seriously harm you, even kill you). There’s also a few crocs around too. The main beach in Cairns is also more of a mud flat. Not to fear, the man-made Cairns lagoon gives you exactly what you need. Crystal clear waters, beach views and life guards. It’s a cool place to laze around and read your book. Day trip to the Great Barrier Reef – a true wonder of the world that is 2,300km long and consists of 900 islands and 2,900 individual reefs. It’s the world’s largest coral reef and the largest living structure on the planet. There are many options for getting out on the reef, some of the main operators are Reef Magic Cruises, Quicksilver Cruises, and Reef Experience. And this post explains how we experienced the reef! Green Island – a coral cay surrounded by white sandy beaches and magnificent coral reefs. You can snorkel straight off the shore and there’s a nice boardwalk through the forest to the other side of the island. Rusty’s Farmer’s Market – a bit of a Cairns institution and one of the cheapest farmers’ market I’ve visited in Australia. Tjapukai Aboriginal Cultural Park – I love Tapajukai Aboriginal Cultural Park for its simplicity and the down to earth way the local people share their culture. We watched dancing shows, made a fire with sticks, and got up on stage and danced and sung with them, learned abbot the didgeridoo, bush medicine and food, and had a chance to throw boomerangs and spears. 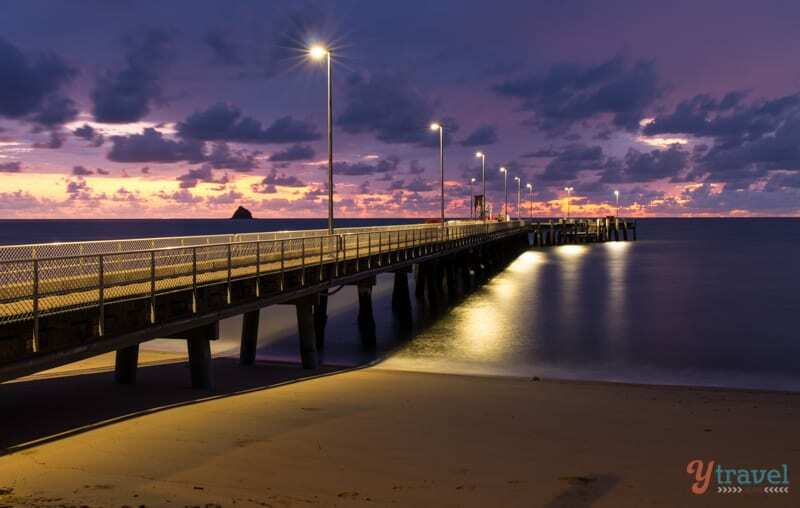 Walk or cycle the Cairns Esplanade – take a stroll along the Esplanade in Cairns, watch the sunrise then grab breakfast at one of the busy cafes and restaurants that line the strip. The Cairns Night Markets – I wasn’t blown away by the Cairns night markets, but it’s a good way to pass an hour or so. White Water Rafting – down the Tully River, or the Barron River in Barron Gorge National Park with Raging Thunder Adventures. Get your tickets here. Atherton Tablelands – about an hour south-west of Cairns, spend a day exploring this region, we especially loved the waterfall circuit. Pick up a rental car as you’ll be needing one anyway over the next few days in the next section of my suggested itinerary. 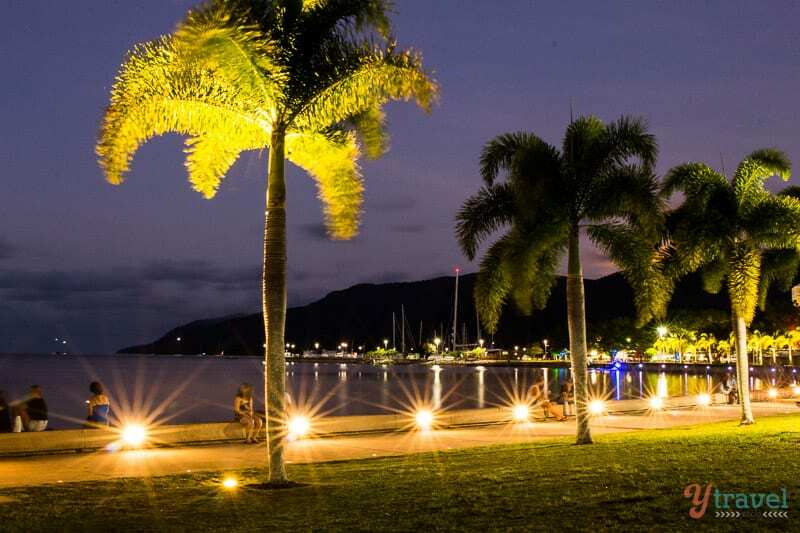 For a full list of accomodation options in Cairns on the world’s biggest booking site click here. If you haven’t got one already, now it’s time to pick up your rental car for your three day loop drive from Cairns to Cape Tribulation via Port Douglas and take in the best that Tropical North Queensland has to offer. It’s one of the most enchanting regions in Australia. I don’t suggest you do this drive as a day trip from Cairns though, it’s 140 kms one way and will be too rushed, so either stay at Port Douglas and do a day trip from there (85 km’s one way) or stay within The Daintree and explore. This drive is one of Australia’s most scenic coastal roads, you’ve got the rainforest on one side and the Great Barrier Reef on the other. If you were to drive from Cairns to Port Douglas without stopping it would only take you one hour, but consider stopping at Palm Cove along the way. Palm Cove is a colourful village and considered to have one of Australia’s most idyllic beaches (there’s a designated swimming area during stinger season). There’s a beachfront playground for children and a gorgeous esplanade to stroll back and forth along for coffee, gelato or endless restaurants to dine in. If you don’t head straight to the Daintree, Port Douglas is a fantastic place to base yourself and explore more of the tropical north. And it’s also another good base to head out on to the Great Barrier Reef. 4 Mile Beach – swim, walk, or laze under a palm tree. A day on the Barrier Reef – check out Quicksilver, Wavelength or Calypso. Barrier reef tours from Port Douglas can be found here. Sailaway Reef and Island Tours – take a sunset cruise, afternoon cruise, or full day cruise. See more sailing tours here. Mossman Gorge – the southernmost end of the Daintree Rainforest. It’s ancient and pristine. A boardwalk takes you to the Mossman River and a beautiful swimming area. Lady Douglas River Cruise – cruise down Dickson Inlet on an iconic riverboat. Flames of the Forest – dine in the rainforest and have an aboriginal cultural experience. Hartleys Crocodile Adventures – one of the best places to see crocodiles and local wildlife. Sunday Markets – a local’s favorite. Surf Club Bar and Bistro – local’s favourite for lunch, dinner, coffee and drinks. On the Inlet – Great location. Go early and feed George (a 250kg Groper fish). Yacht Club – Fantastic location and seafood. Great value meals and well-priced drinks. Courthouse Hotel – It’s an absolute must for beer and fresh prawns. The Tin Shed – Watch the boats come in late afternoon and enjoy the cheapest drinks in town. Salsa Bar – Excellent ambiance and food. Fantastic cocktails and margarita jugs! For a full list of accomodation options in Port Douglas on the world’s biggest booking site click here. At 110 million years old, the Daintree Rainforest is possibly the oldest existing rainforest in the world, even pre-dating the Amazon. It’s World Heritage listed and sits smack bang along side the Great Barrier Reef – the only place in the world where two World Heritage sites meet. It’s a must visit part of Australia! 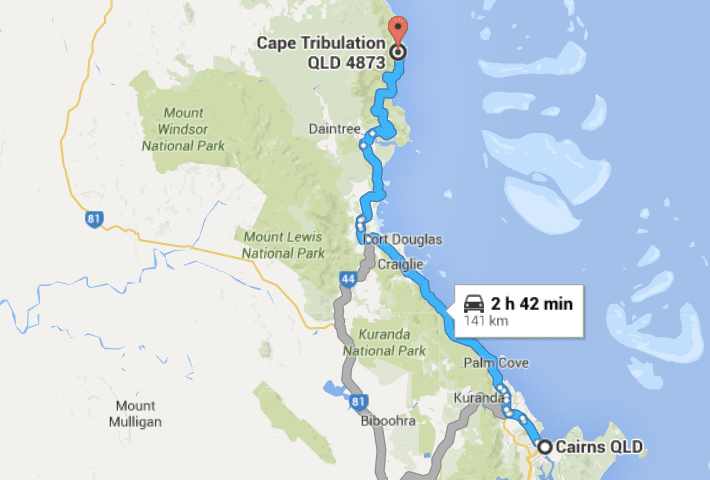 From Port Douglas, the furthest north we have been is to the spectacular Cape Tribulation (85 km’s one way). Cape Trib is a headland located within the Daintree. Cape Kimberley – the first beach you come to in Daintree National Park. Alexandra Lookout – stop here for beautiful views out over the Alexandra Range and Snapper Island. 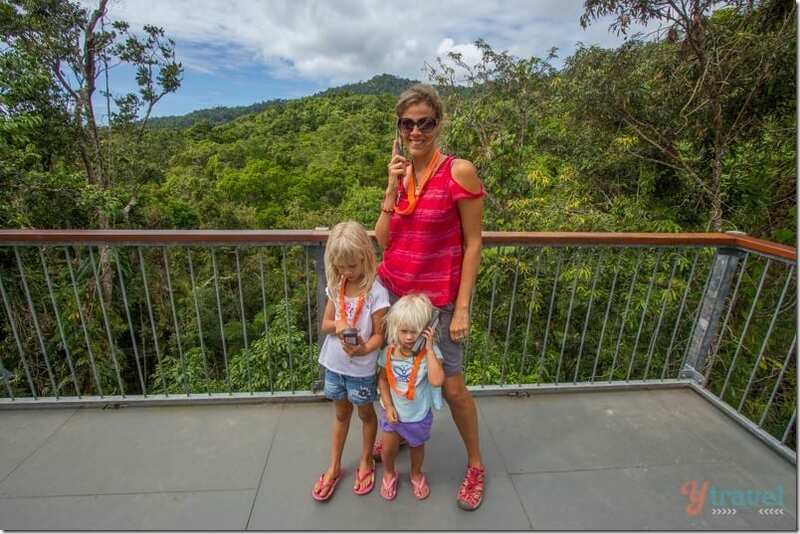 Daintree Discovery Centre – do the self-guided audio tour and aerial walkway. 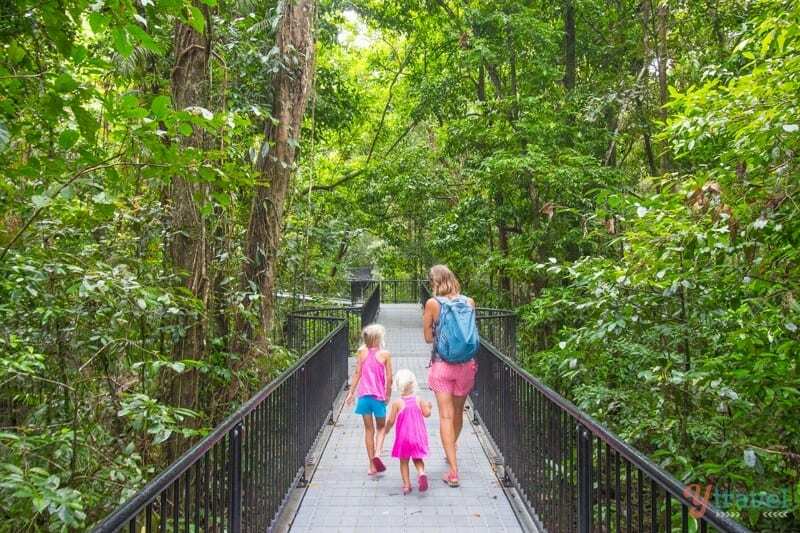 Maardja Botanical Walk – the 540m boardwalk follows the creek through a section of rainforest and past the eerily twisting roots and vines of the mangroves to a lookout over Noah Creek. 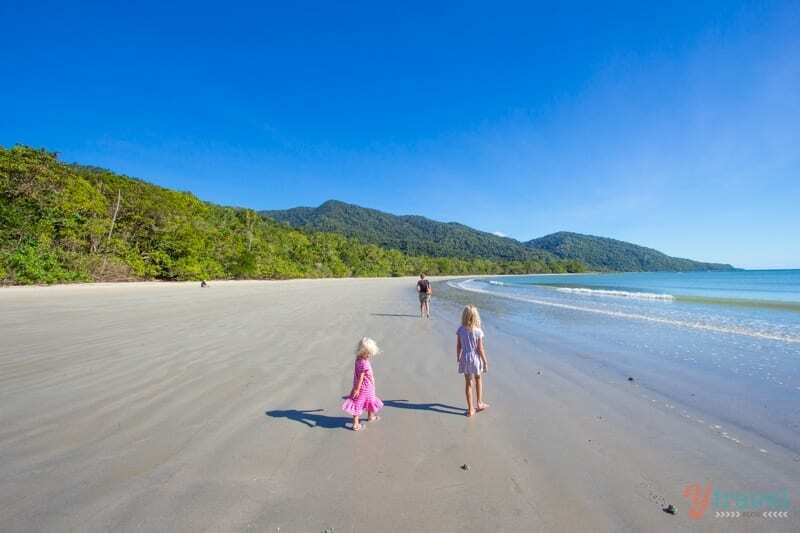 Cape Tribulation – the prettiest of the beaches in the Daintree. Walk along the beach and then back up to the Kulki boardwalk. Dubuji Boardwalk – the 1.2km boardwalk winds its way through the mangroves, shaded by it’s canopy of enormous fan palms, strangler figs and vines leading down to Myall Beach. Mason’s Cafe – the burgers are legendary. Pick your animal: wild boar, emu, crocodile or kangaroo. Daintree Ice Cream Company – for $6 get a bowl of ice cream with four scoops. The flavours depend on what they’ve made at that time based upon the exotic fruits that have been harvested from the orchard. Thornton Beach Cafe – nice spot to stop for lunch or breakfast right on Thornton Beach. Return your rental car to Cairns airport then fly to Alice Springs and visit Australia’s most famous Outback town and begin your Outback adventure (Qantas and Virgin Australia fly direct). Alice Springs is a thriving, spirited outback centre famous for the personality of its locals and contemporary and traditional art as the natural wonders. Framed by the MacDonnell Ranges and the desert landscape, Alice has all the conveniences of a modern township imbued with a rich living Aboriginal tradition and European explorer history. Spend a day or a week exploring the sites of Alice Springs. Pick up a 4-wheel-drive rental car in Alice Springs for the next five days of exploring Central Australia. Telegraph Station Historical Reserve – learn about the construction of the Overland Telegraph Line from Port Augusta in South Australia to Darwin. Onsite cafe and walking and cycling tracks. School of the Air visitors centre – learn about the world’s largest classroom, covering more than 1.3 million square kilometres. 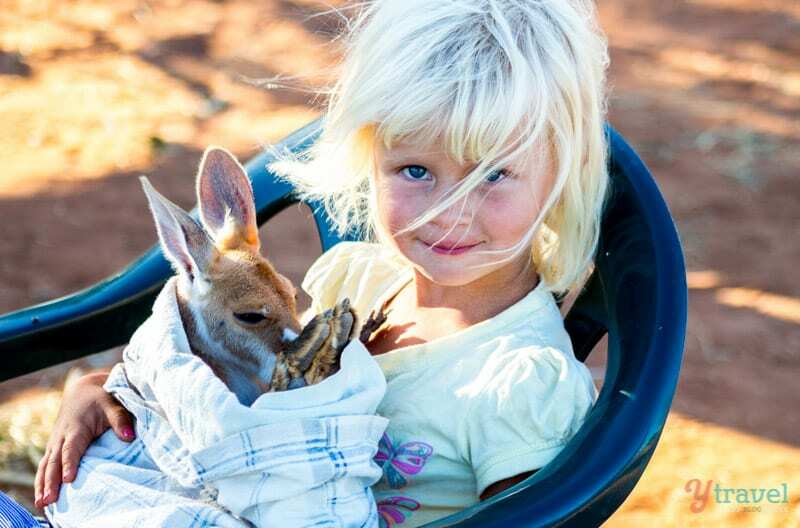 The Kangaroo Sanctuary – Get up close with kangaroos at the home of Brolga, star of the documentary series Kangaroo Dundee – BBC UK / Nat Geo USA. Do the guided sunset tour! Royal Flying Doctors Service Museum – learn about one of the largest aeromedical organisations in the world, providing extensive primary health care and 24-hour emergency service to people over an area of 7.3 million square kilometres. Desert Park – see the animals that live in Central Australia’s habitats. Anzac Hill – for a panoramic view of the town. 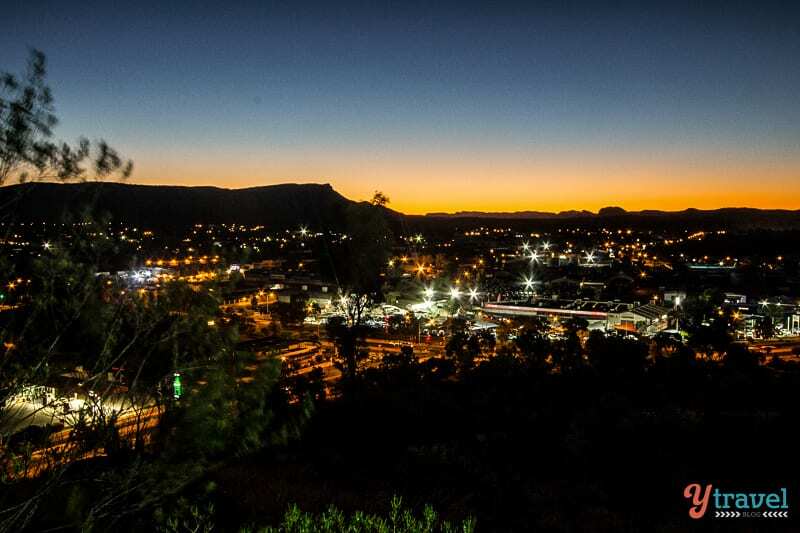 Sunrise is the perfect time as you watch the sun slowly rise to light up the MacDonnell Ranges and beautiful desert town below. 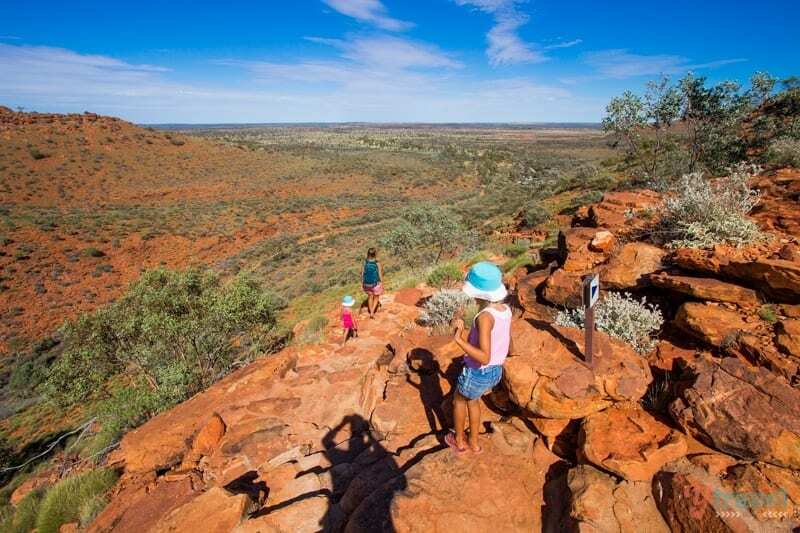 The Red Centre Way is one of the Australian Outback’s great drives, stretching from Alice Springs to Uluru and taking in the stunning landscapes of Kings Canyon and Ormiston Gorge. Today’s drive is approximately 177 km’s from Alice Springs to Glen Helen Homestead taking in some of the best scenery in Central Australia along the West MacDonnell Ranges. Simpsons Gap (23km from Alice Springs via Larapinta Drive) -prominent waterhole is an important spiritual site to the Arrarnta Aboriginal people. At dawn or dusk, Simpsons gap is renowned as a place to see Black-footed Rock-wallabies along the gap’s short walking track. Standley Chasm (40km) – When the sun’s light shifts across the cleft, the walls of Standley Chasm glow golden, orange and red. There’s a pretty 15- 20 min walk along the creek beside rare ancient cycads, and where spring-fed pools give the valley floor a lush, tropical oasis feel. Onsite cafe. 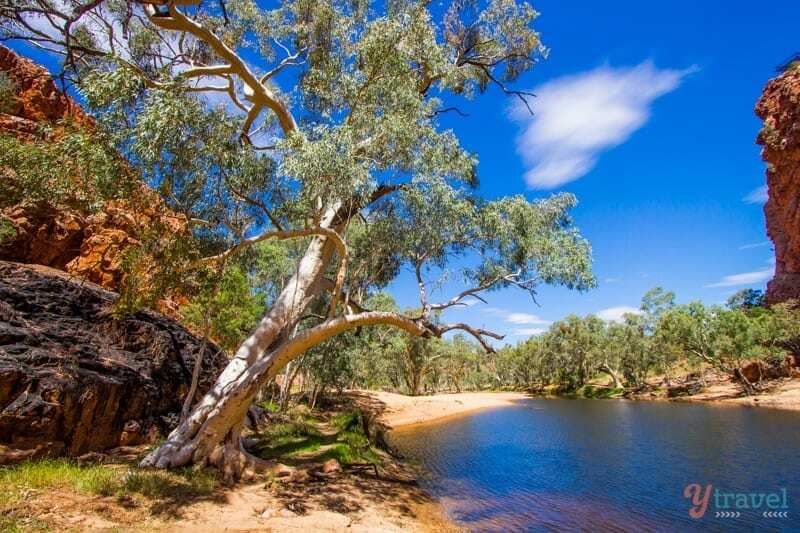 Ellery Creek Big Hole (57km) – a favourite swimming hole for the locals and a great spot for a picnic. Ochre Pits (22km from Ellery Creek) – brightly coloured small cliffs that local Arrarnta Aboriginal people have used for thousands of years for their ceremonial paint. The layers of white, yellow and red ochre of the cliffs are so rich and earthy. Ormiston Gorge (24km) – the biggest and prettiest swimming hole. It’s also the most popular. There is a kiosk open here and apparently serves a phenomenal ice coffee. 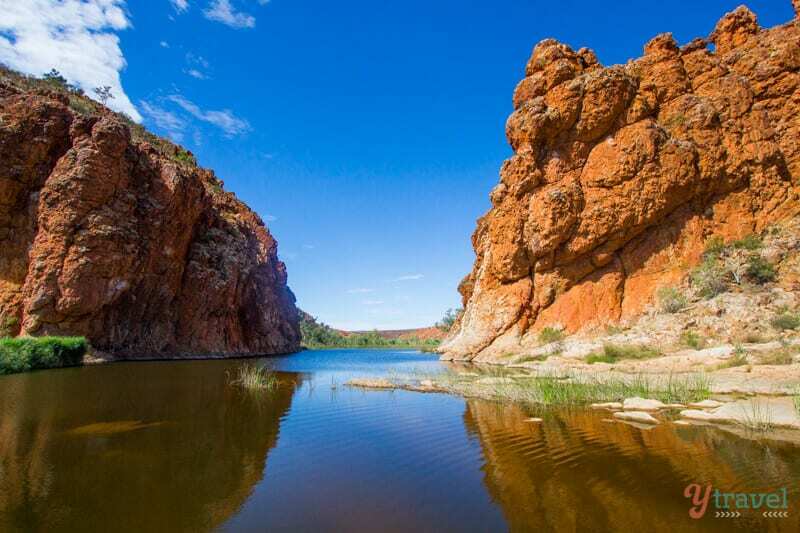 Glen Helen Gorge (11km) – The permanent waterhole at Glen Helen Gorge is a favourite home to many species of desert wildlife and lies at the headwaters of the Finke River, where you can walk along the riverbed between the gorge walls to see fabulous cycads. The traditional owners believe Glen Helen Gorge is the home of an ancient and powerful Rainbow Serpent. Overnight at Glen Helen Homestead Lodge which offers motel room type accommodation for families or singles plus caravan and camping sites. There’s a restaurant, bar, fuel (diesel & unleaded) and a swimming pool. Enjoy breakfast out on the deck at Glen Helen Homestead. The views out over the West Mac ranges are stunning and it is very serene watching the eagles soar quietly above looking for their own breaky. 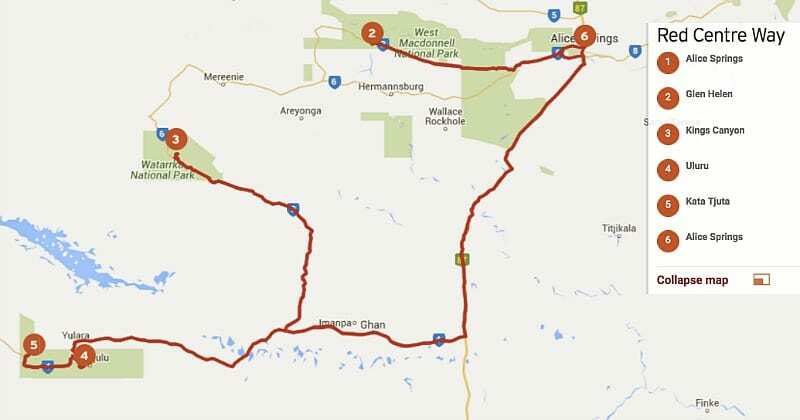 Depart Glen Helen and drive 225km along the Mareenie Valley Road and overnight at Kings Canyon Resort. Make sure you have a full tank of fuel, water and food supplies. This section of road is unsealed and can be badly corrugated, that’s why we suggest a 4×4 vehicle for clearance and comfort and control not because it’s technical off-road driving. Some people drive this in a 2WD. Kings Canyon Resort offers comfortable lodging and hotel style rooms plus camping and caravan sites. Facilities include 2 restaurants, 2 swimming pools, and a petrol station. 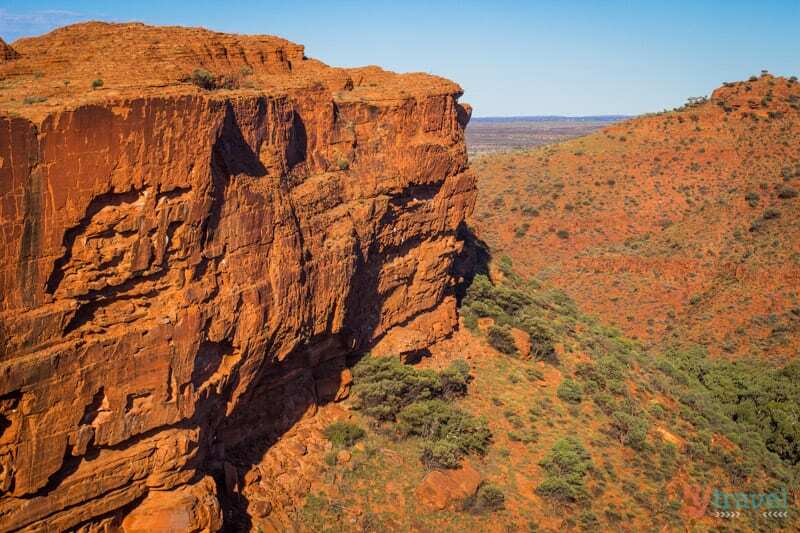 Iconic Kings Canyon is just 7 km from the resort. The 5.5km Kings Canyon Rim Walk in Watarrka National Park offers spectacular views of the canyon and stunning dome shaped rock formations and the colours change as the sun continued its journey up. We did it at sunrise with our three and six-year-old daughters, with the only steep part of the walk being the climb to the top at the beginning. The drive from Kings Canyon to Yulara, the main town at the gates into Uluru-Kata Tjuta National Park where all the accommodation and shops are, is 300km. Here is a full day tour to Kings Canyon from Uluru. 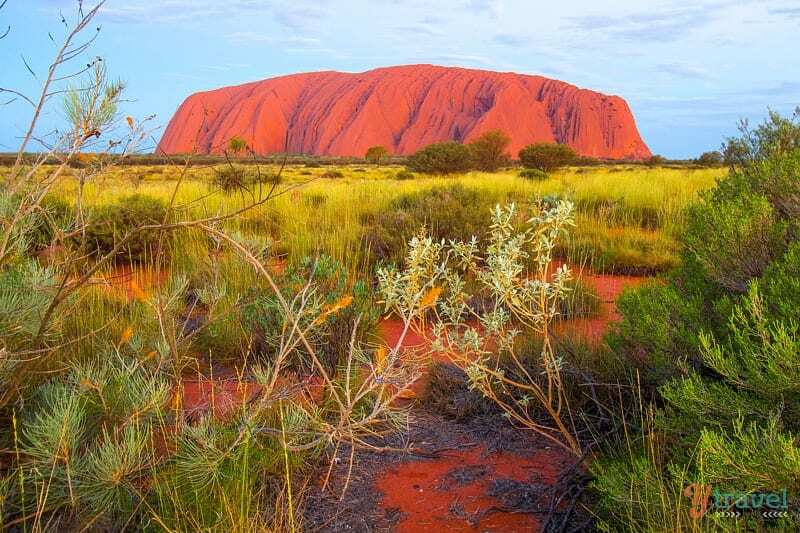 Uluru, previously known as Ayers Rock, is the spiritual heart of the country and a must see when you visit Australia. You’ve probably seen hundreds of photos and TV commercials of Uluru, but it’s a place you have to see and feel, for yourself. Made of arkosic sandstone, Uluru stands 348 metres high and is taller than The Eiffel Tower and 2.5 times the height of Sydney Harbour Bridge. We highly recommend you don’t fly in and out in a hurry, Uluru needs more than one night to appreciate it’s beauty! Uluru Sunset – the are several lookout spots for sunset and every lookout offers a different perspective of the vibrant and ever changing colours. 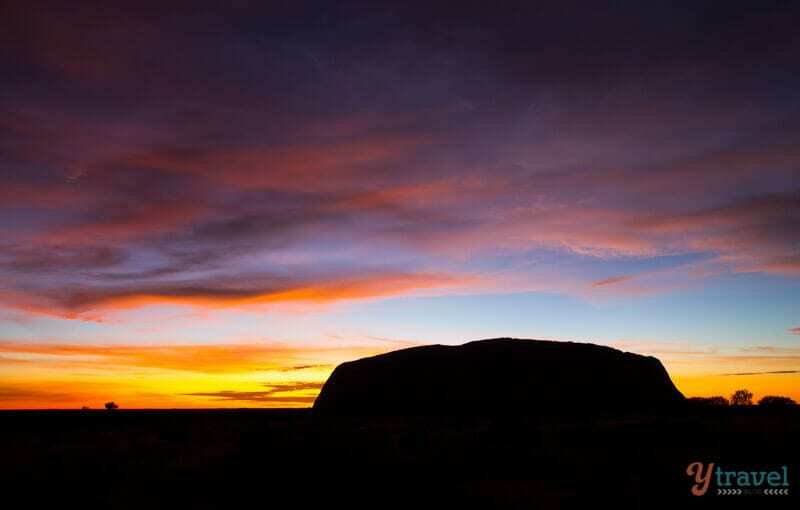 The most popular sunset spot is the official Uluru Sunset Lookout about 10 kilometres down the road through the entrance gates of the park (entry fee $25 for three days). Uluru Sunrise – we dragged the kids out of bed at 5.am each day and jumped in the car for the 20-minute drive from Yulara into the park (sunrise was around 6.20am). For our first Uluru sunrise, we headed back to the Talinguru Nyakunytjaku lookout. Be warned, this is where hordes of people and tour buses converge and was very busy even in the off-season. HOT TIP – for a great Uluru sunrise silhouette, on another morning we headed back to the sunset lookout spot as you get the rock blocking the sun as she rises. Whilst everyone heads to the Talinguru Nyakunytjaku lookout for sunrise, we had this sunset spot all to ourselves! 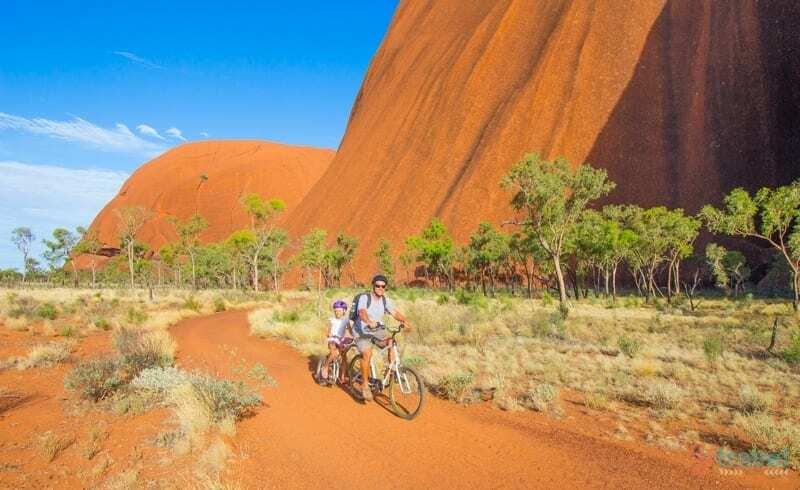 Cycle the base – if you’re not up to walking the 10.6 kilometres around the base, a great alternative is to hire bikes from Outback Cycling ($30 for three hours) or bring your own and bike it. We had a tag-along for Kalyra who enjoyed the relaxation of letting daddy do most of the peddling, and little Savannah took in the sights in a baby seat on the back of Caz’s bike. 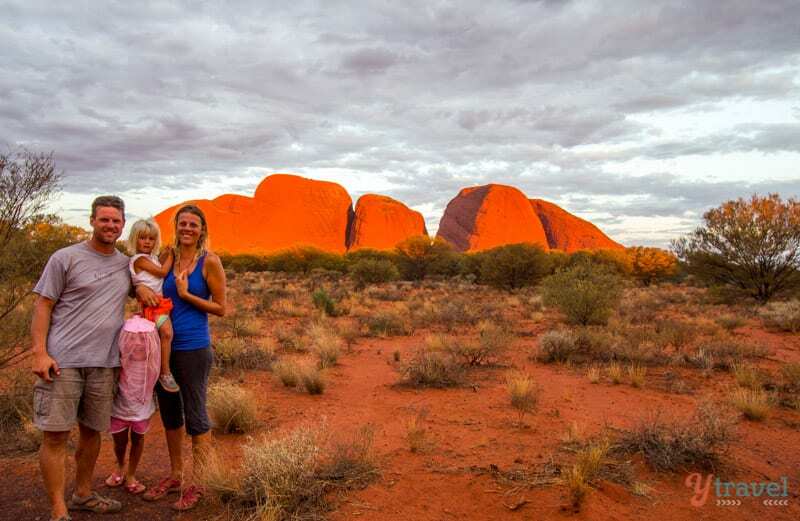 Free Ranger Guided Mala Walk – your third option if you don’t want to walk or bike the whole 10.6 kilometres of Uluru is to participate in the two-kilometre return walk (1.5 hours) free ranger guided Mala walk. 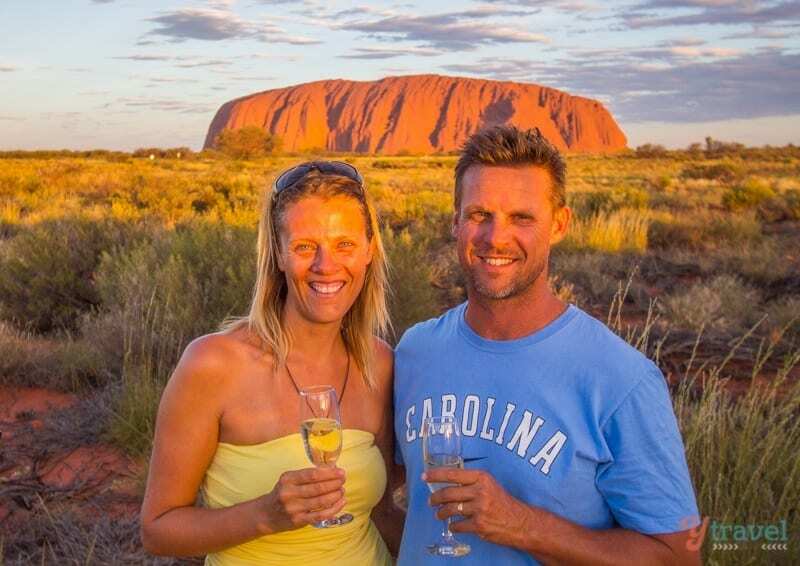 Sunset drinks – A fitting farewell to our time at Uluru was sipping on a few glasses of champagne with the folks from AAT Kings as the sunset over the rock. You can book a sunset viewing bubbly experience here. Sunset Camel Ride – one of the unique ways to take in Uluru is on the back of a trusty camel. 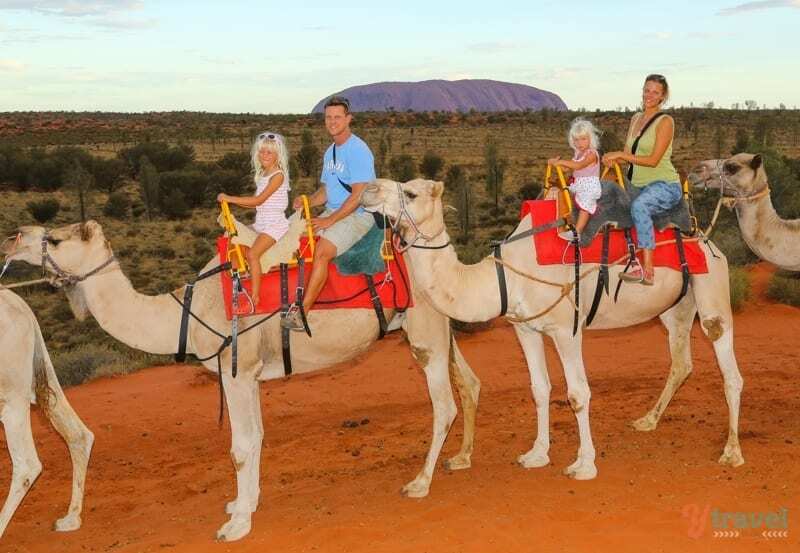 Our kids, and us big kids, absolutely loved this experience with Uluru Camel Tours. Book a sunset experience here. On our bucket list is the Sounds of Silence dining experience under the stars (when the kids are a bit older) and a helicopter flight sounds amazing too! Kata Tjuta is just 50km’s up the road from Yulara and is equally as impressive as Uluru. 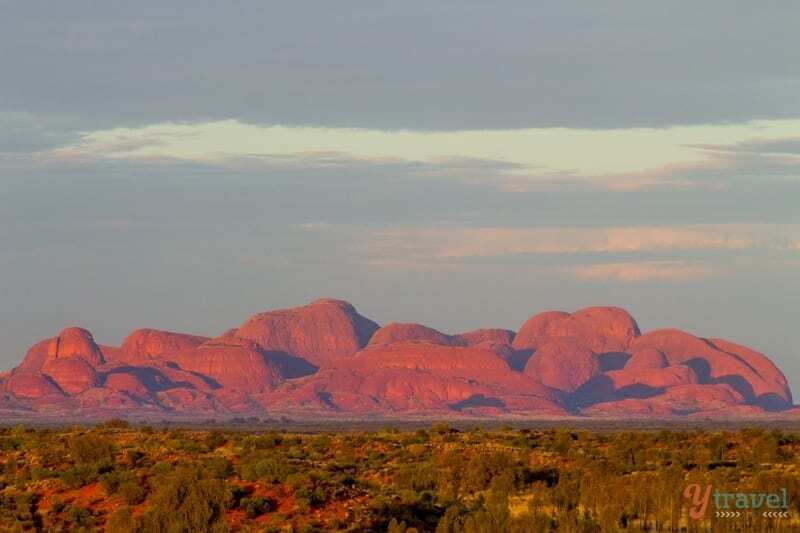 Formerly known as The Olgas, this group of large ancient rock formations consisting of 36 ochre-coloured domes are spread over an area of more than 20 kilometres. The sandstone domes are believed to be around 500 million years old. Hot tip – for another brilliant sunrise silhouette of Uluru head to the Kata Tjuta dune viewing area. The 2.6 km Walpa Gorge walk is the shorter and easier of the two walks. The longest trail is the 7km Valley of the Winds Walk. 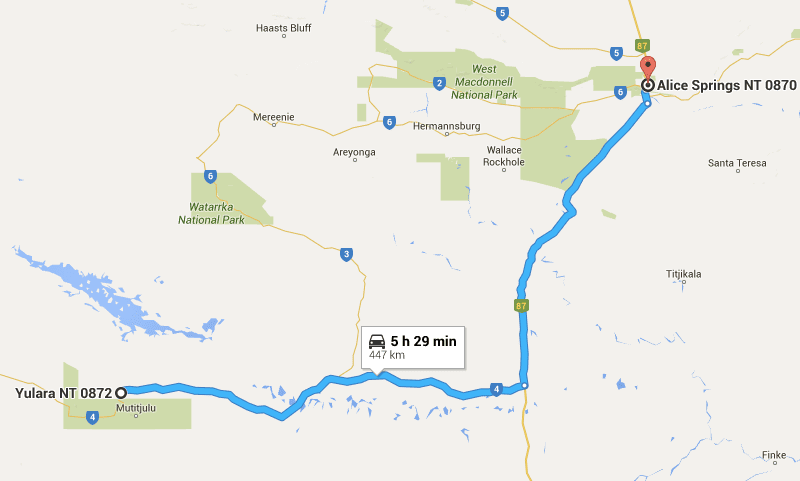 The drive from Yulara back to Alice Springs is 447km via the Lasseter Hwy and National Hwy 87. Alternatively, instead of driving back to Alice Springs and catching a flight to Melbourne, you could do a one-way drop off of your rental car at Ayers Rock Airport, which you can do through RentalCars.com and fly to Melbourne from there. You just need to weigh up the cost of a one-way rental drop off versus return and the different flight prices to Melbourne from either Alice or Ayers Rock! 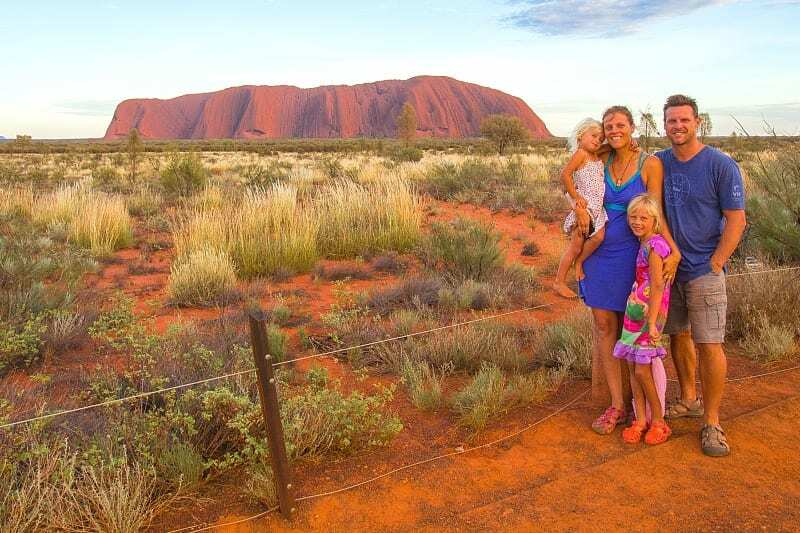 Jetstar, Qantas and Virgin Australia fly direct to Melbourne from Ayers Rock Airport. In fact, if you won’t to shorten this whole itinerary and skip Alice Springs and the Red Centre Way, you can fly direct from Cairns to Ayers Rock Airport, then onto Melbourne. Just an option, or a way to add extra days at the other locations. Pick up your rental car from the airport and hit the Great Ocean Road, famous in Australia and around the world as one of the best drives on the planet. Beginning one hour outside of Melbourne in the town of Torquay, it stretches over 250 kilometres to Warrnambool, and attracts tens of thousands of visitors every year. Whilst the tour buses crazily drive this in one day, don’t just rush to the 12 Apostles for your tourist snap. Slow down and appreciate all it has to offer. Visit all the rock formations and towns, walk on a beach and in the rainforest, see a waterfall and wildlife, sit at a lookout and be present. I recommend a minimum of three nights / two days overnighting in Lorne, Apollo Bay and Port Campbell along the way. Hot Tip – drive from Torquay to Warrnambool (East to West). That way you’ll be on the left side of the road closest to the ocean and you’ll be able to pull over easier to all the view points. Torquay (104 km’s from Melbourne) – Bells Beach is one of Australia’s most famous surfing beaches. Visit the Australian National Surfing Museum. Do a section of the Surf Coast Walk. Anglesea (18 km) – get some sun on Anglesea’s main beach, a wide sandy expanse beside the Anglesea River. Walk along the rugged coastline or head inland beside the Anglesea River on the 44-kilometre Surf Coast Walk. Aireys Inlet (9 km) – Split Point Lighthouse was built in 1891 and is perched on the cliffs 70 metres above sea level. Walk along surrounding cliff top tracks to see rocky reefs, rock pools and sheltered coves (keep your eye out for whales in season). Lorne (20 km) – a picturesque town situated right on the Great Ocean Road. Great cafes, unique shops boutiques, galleries and Otway National Park is on your doorstep. Enjoy a walk on the beach, a bike ride along the foreshore out to the pier, have a coffee at Lorne Beach Pavilion and try a burger from The Bottle of Milk. Teddys Lookout is a short drive up the hill behind Lorne. Drive up to the picnic area at the end of George Street and walk a short distance to enjoy the spectacular views of the Great Ocean Road from the lookout. Lorne –> Apollo Bay Drive – our favourite stretch of road along the GOR. Be prepared to stop for photos a lot. This stretch of road has some of the most picturesque scenery in the region. It hugs the cliff-face as it winds through the Great Otway National Park and rolling farmland. Apollo Bay (47 km’s from Lorne) – seaside village half-way along the Great Ocean Road and surrounded by Otway National Park State Forest. 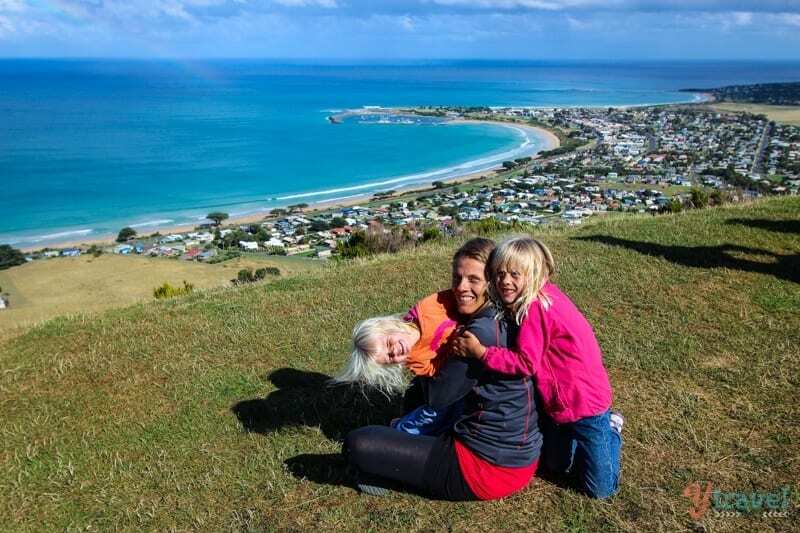 Mariners Lookout offers panoramic views of Apollo Bay’s town centre, the harbour and beaches up and down the coast, located at the northern end of town off Marriners Lookout Road. Climb aboard a kayak, get up close to local seal colonies or sign up for a deep sea fishing adventure. There are sunset beach rides on horseback, gift shops, galleries and tea houses along with countless culinary delights on offer – fishing is an important local industry so seafood is always on the menu! Otways National Park – head into the Otways and immerse yourself among tall trees and giant tree ferns, and beautiful waterfalls – Triplet Falls is a highlight. The walk is about a 1 hour return loop. And the 2km Shelley Beach Circuit Walk is one of the best short walks on the Great Ocean Walk. Kennett River – want to see koalas in the wild? The best koala viewing spot is Kennet River, along the Grey River Road, just in the middle of town. Otway Lighthouse Road is another popular spot. Just look for the crowds of people and follow their gazes up for quick koala spotting. Twelve Apostles (87 kms from Apollo Bay) – Port Campbell National Park is home to these massive limestone structures tower 45 metres above the ocean and were formed some 20 million years ago. There are only eight remaining (the rest have fallen) and forming the backdrop are these magnificent cliffs up to 70 metres high. Hot Tip – get there for sunrise or sunset so you miss the hordes of people and tour buses that arrive around lunchtime (we stayed overnight in Port Campbell, 15 km drive and drove back for sunset). Gibson Steps – just down the road from the Twelve Apostles Visitors Centre are the Gibson Steps. Walk down these steps on to the beach for a close-up view. Loch Ard Gorge – a few minutes drive west of The Twelve Apostles. Named after the ship Loch Ard, which ran aground on nearby Muttonbird Island at the end of a three-month journey from England to Melbourne. The Grotto – is basically a sinkhole. Take the steps down the cliff face to the bottom and look through and you’ll get visibility of the ocean beyond a pool at low tide. Pretty cool. London Arch (London Bridge) – formed by a gradual process of erosion and originally was a complete double-span and attached to the mainland. The arch closer to the shoreline collapsed unexpectedly in 1990. The Arch – this naturally sculptured arch stands 8 metres high and is located 6km west of Port Campbell. Bay of Islands – head a little further south to Peterborough and you’ll discover the mystical Bay of Islands and Bay of Martyrs. Almost as beautiful as 12 Apostles, yet rarely talked about. The direct drive back to Melbourne from Warrnambool is 255 km (approximately 3 hrs) via the Hamilton Hwy/B140 and M1. Drop off your rental car at the airport and make your way into the city. Melbourne Airport is located 25 km from the City Centre. The Sky Bus offers a regular shuttle service 24/7 direct to Southern Cross Station in the city ($19 one way). They also offer a hotel drop off and pick up service – ask for details at the counter. For those who want to do a tour of the Great Ocean Road, you can check out these tours from our partner Get Your Guide. We love Melbourne, it’s probably our favourite Australian city and feels very European. The downside is it comes with the four-seasons-in-one-day weather patterns. Wear layers! There really is something for everyone in Melbourne, no matter what your budget or tastes are. Also, it is a well known fact among Australians that they make the best coffee in the country! City Circle Tram – jump on the FREE city circle tram service (route 35) that operates within Melbourne’s CBD and passes major tourist attractions. The loop takes about 45 minutes and you can get off at any one of the many stops to explore more on foot, and is the best way to get around to many of Melbourne’s inner city highlights. 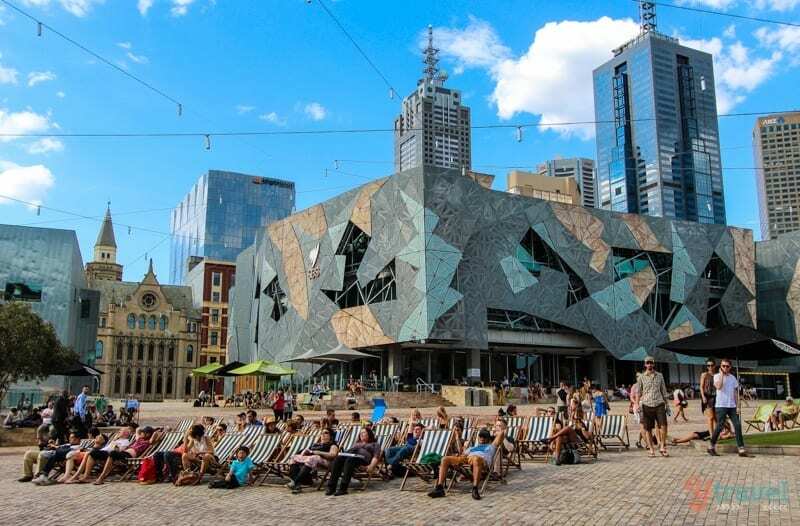 Federation Square – Fed Square occupies a whole urban block right on the banks of the Yarra River and directly opposite Flinders Street Train Station and St Paul’s Cathedral in the heart of the city. There’s museums, galleries, restaurants, bars, festivals and fun. And the Melbourne Visitor Centre is located underground. Such a cool urban square! 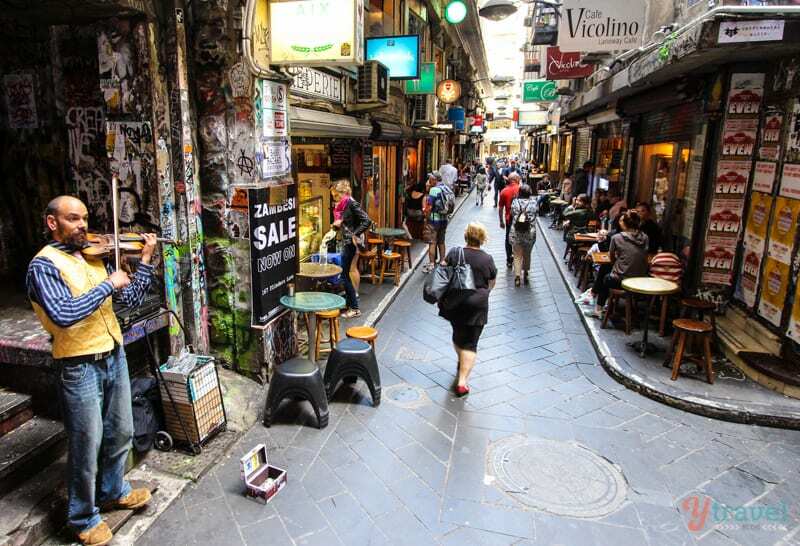 Shopping – the city laneways, especially between Flinders, Elizabeth, Bourke and Swanston Streets are terrific. Little Collins Street is also very good for relieving you of some of your cash. Also check out Prahran and Chapel Street which runs from the Yarra River in the north to Brighton Road in the south, traversing the suburbs of South Yarra, Prahran, Windsor, St Kilda and St Kilda East. St Kilda – jump on a tram and head to this seaside escape. 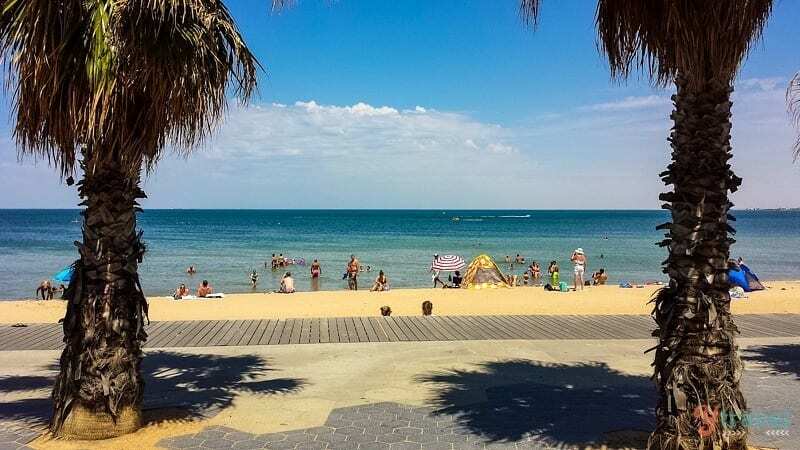 It’s the closest and easiest beach to get to from the city, just 6km away, and it’s Melbourne’s most famous beach. There’s outdoor dining and bars, many with bay views, and the sunsets are pretty special. Acland Street is the place to go for cafes and restaurants, but also for the famous cake shops. West Beach Cafe is right on the sand and Jerrys Milkbar is a converted milkbar with a little playground out the back and awesome banana bread. Check out Carlisle St in St Kilda East, easy walk from Acland St. Less touristy, a bit grimey, but lots of character and great cafes. Queen Victoria Market – who doesn’t love a good open air market? The Queen Vic Markets has something for everyone. Grab some fresh produce and head to either Fitzroy Gardens or Carlton Gardens for a picnic. Wednesday Night Markets (summer months) – Queen Vic Markets come alive with great street food, with offerings from all over the world. It was like any night food market you’d find in Asia, buzzing with atmosphere and cheap (for Melbourne) street food. Live music and family friendly. AFL game – if you’re here during the AFL (Australian Football League) season, you must check out a game. The atmosphere in the massive MCG (Melbourne Cricket Ground) is unlike anything else in this country. Fitzroy – for the cafes and restaurants, not to mention all of the boutique shops, many catering for a hip crowd. Lygon Street – for all things Italian. We recommend Tiamo for great and affordable Italian. And Brunetti’s is a Melbourne institution for coffee, cakes and pastries. 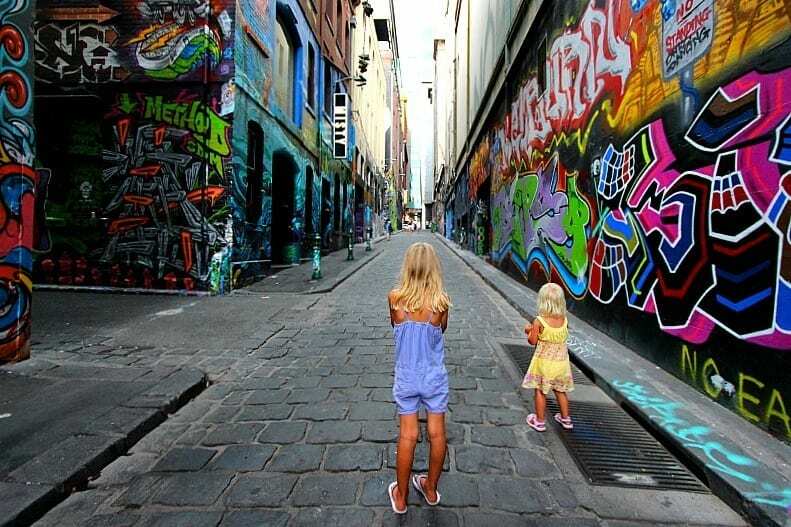 Laneways – Melbourne is famous for its laneways. Centre Place is a busy laneway between Flinders Lane and Collins Street and home to several vibrant bars, cafes, restaurants, boutiques, sushi bars and shops, as well as some of Melbourne’s best examples of street art and graffiti. As is Degraves Street. Hardware Lane has lots of great Italian. Royal Arcade is old and very beautiful (great chocolate shop too). Coffee – Melbournians are obsessed with coffee and make it better than most. Here’s a list of some best coffee spots on Lonely Planet and the Tourism Australia website. South Bank – a nice place to walk around on the Yarra River with great views back over the city, and endless dining and bar options. Riverland Urban Beer Garden – just down by Fed Square and next to the Yarra is a great spot for a beer and a meal in the sun and to watch the rowers on the river and overlooks the Princess Bridge. Feels like London in the summer. They have a kids menu too! Hosier Lane – a much celebrated landmark due to its sophisticated urban art (graffiti lined walls). A 2 minute walk from Federation square and runs between Flinders St and Collins St. Local and international artists use the walls as a temporary canvas for their works, and the art is very interesting to look at. Chinatown – if there’s a Chinatown in town, we’re there! Rarely are we disappointed, and our bank balance is always happy. One place in Melbourne we kept going back to was the popular Camy Shanghai Dumpling and Noodle Restaurant – not for the posh and fancy, it’s a genuine Chinese experience with below par service, but their dumplings were a highlight and cheap! Botanic Gardens – take the family for a picnic or sit on the banks of the Yarra and watch the world go by. 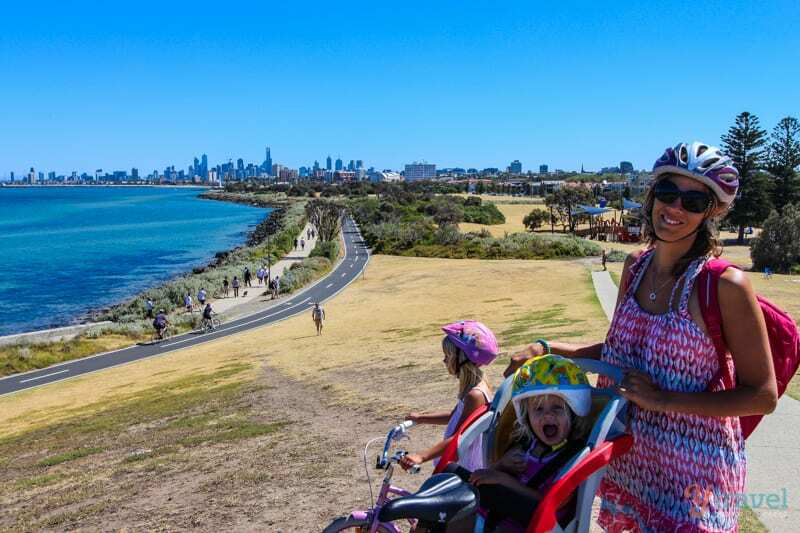 Cycle the Bayside Foreshore – stretch the legs on a bike ride from St Kilda to Brighton Beach and check out the colourful bathing boxes. Eureka Tower – offers stunning views from the highest observation deck in the southern hemisphere, Eureka Skydeck at 297 metres/88 floors. I recommend going up just on sun down so you experience Melbourne by day and as it slips into night. Walk along the Yarra River and a BBQ on the river bank in Summer. For a full list of the best accommodation in Melbourne that we researched click here. Worried about all the deadly animals in Australia? Don’t be. This post will help ease your fears. I hope! Are you planning to visit Australia? Need any tips for your Australia itinerary? Please leave any comments or questions in the comment section below! G’day and thank you so much for this article (as well as for your great blog)! I am a huge fan of Australia and I plan to visit my top destination soon. In your opinion, is Adelaide a must – see city or one should spend more time elsewhere? I’ve heard that some people prefer to take a bus from QLD to The Outback, is this recommended? (yes, I am one of those who don’t drive). I’m not familiar with bus tours to the Outback, but one company that comes to mind is AATkings: http://www.aatkings.com/ Hope that helps. Australia is one of the best destinations out there, and I love your itinerary! I began my travel journey with a one-way ticket to Sydney. This completely breaks down how to travel there and allows for the full experience. This is fantastic! What about if I don’t drive? There are plenty of buses or trains you can take. You have loads of different options. Great article, loved my visit to Australia, I’d actually rather visit Australia then Europe. I’ve never met nicer people, or visited a more beautiful country. Of course, I wasn’t trying to act all “American” which might have something to do with it! I spent 17 days there, saw many of the things you’ve mentioned plus Hobart, Tazmania, just had to see a Tazzie Devil! A couple of things I did which might be of interest…Tour Sydney harbour on a sailboat..just one on the best days on the trip…in Melbourne I did a tour of the You Yangs with Echidna Wildlife Tours..saw my first wild Koalas and Kangaroo mob! As well as the famous Melbourne Hook Turn…THAT took a bit to get used to and I wasn’t driving!! Cheers Mark. Happy to hear you had a great experience traveling around Australia. Thanks for the extra tips too, the list is endless in what we have to see and do here. It’s a quality problem I guess, such a big country with so many things to do but most people don’t have oodles of time! thank you so much for this absolute interesting and catching travel proposal for a “short” OZ visit. We love your reports and blogs on OZ. Since we are pensioners, we would allow double time – if we can afford it! We´ll have to save up and definitely have to see your beautiful country on the other side of the globe in the near future. It is a long way from us. You are a valuable “ambassador” for your Country!! Best greetings from sunny Austria. You are welcome. Glad that you find it useful and sincerely I hope you get to visit Australia soon and live out your travels down under. Cheers to you guys in Austria! Thank you very much for such a detailed itinerary. This is very timely as I plan to spend couple of months towards the end of this year starting in Perth and then moving north and eastward. As I will be traveling solo, I am thinking of taking small tour groups. I was wondering if you have any recommendations for tour groups especially for traveling in WA and NT. Thanks so much for writing this article on traveling Australia Its something I want to do in the next couple of years. I am glad that you planned a trip out in such great detail. Im going to be sure to save this great information. Hi Keith. Your welcome. Hope you get to visit Australia soon and put this Australia itinerary to good use! Thank you so much, Craig & Caz! This was wonderful (and obviously a lot of work!) and so helpful! As a Southern Californian (San Diego), I recently returned from a 3-week whirlwind tour around Australia in April/May (my first!). I enjoyed reading your top picks, many that I saw too (and also loved!) – like Sydney, Melbourne, Iluru (too quick a visit), and Port Douglas for the Great Barrier Reef (but not Daintree/Cape Tribulation). I am saving your list for my next trip back to your beautiful country – to see the rest of your favorites. I will also share this in the future with any friends who are planning their own Down Under travels. Thanks again. Hi Janet. Yes it was a lot of work to create, but wanted to create something detailed for those who want to visit Australia over a few weeks. Happy to hear you have already visited Oz, and appreciate you sharing this Australia itinerary with your friends! Great article, I love to get to know itineraries made by locals and this is a gem. Whenever I visit Australia it will most likely be for three weeks so this is perfect, well done. Hey Bruno, happy to hear you like our Australia itinerary. We love to get travel advice from locals too and a lot of our tips in this articles were from other locals and travelers as we explored Australia. One heck of a blog post! So detailed. We are surely gonna refer this extensively when we go to Australia. I am so hoping that we will get at least 3 weeks! Highly tempting. These pictures are worth being in anyone’s recurring dreams! Hi! If you went for budget accommodation everywhere roughly how much without flights are you looking to take for the 3 weeks? These two posts will help you figure out the rough costs https://www.ytravelblog.com/cost-of-travel-in-australia/ https://www.ytravelblog.com/travel-australia-budget/ It’s hard for us to say as spending habits are different for each person, but the info in those posts will help you make a more accurate estimate. Thank you so much for this article. I have heard a lot about kangaroo island but you didn’t mention it? Can you give your opinion about it? We really want to see Australian wild life? Also is there a place where you can be with dolphins in natural habitant? Exploring Australia what a great holiday and some great tips here on how to see a wide variety in a short period of time. Hi Jenny, yeah, I hope it’s helpful for those who want some tips on how to visit Australia on a short time frame. It’s a 9 hour drive (734km) from Coober Pedy to Uluru (Ayers Rock). If you are driving from Adelaide, sure, but depends on how long you have and what the rest of your trip looks like? Coober Pedy is a very interesting place, but like I said, it depends on your other plans? I really enjoy your blog and this itinerary is just what i was looking for! My husband and i are planning a trip to Australia this coming February/March for approx 1 month. I will be following the tips in this itinerary because it really hits most places i want to see. Although i would really love to see The Whitsundays and also visit Broome and Exmouth beaches. With an extra week (4 week itinerary) do you think it would be possible to see some of the Western Beaches as well? Hi Samantha, happy to hear you have found this post useful for when you visit Australia in February. 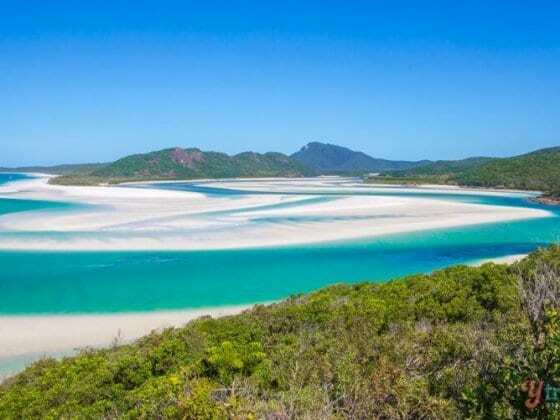 With an extra week you could definitely visit the WHitsundays as they are on the east coast. The problem with Broome and Exmouth is that they are quite isolated, you have to fly to Perth and then fly up to Broome which can be timely and costly. 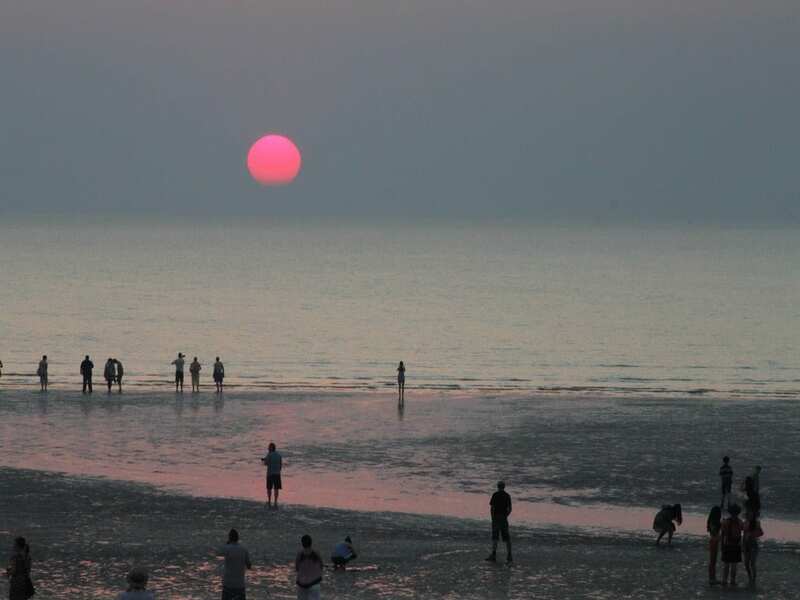 We love Broome, it’s our fave, and you could do it, but it would be a big trip. If you did it I would concentrate on Broome and leave Exmouth for another trip that’s more WA focused. Esperance, Exmouth and Coral Bay show case some of Australia’s most pristine and best beaches. 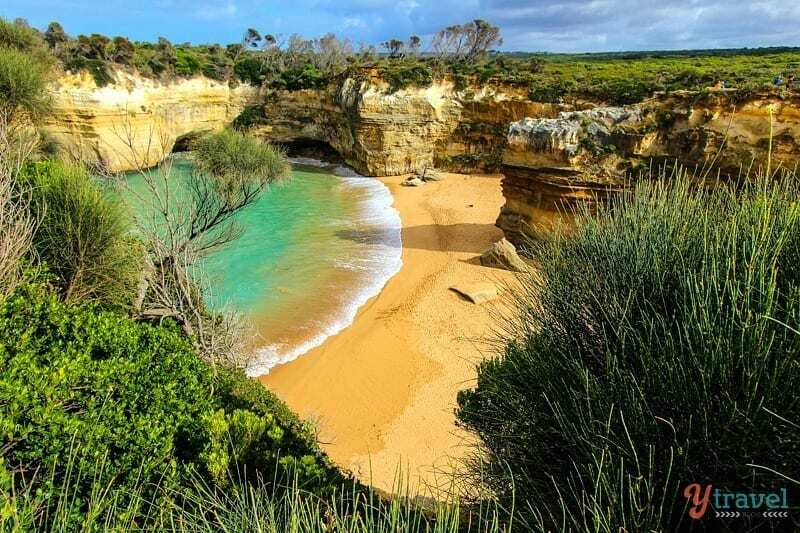 You are missing out if you skip these places in Western Australia if you are wanting to experience “”wow”” beaches of Australia. I grew up in Perth (white sand nice beaches the norm in the city) and have travelled all around Australia and even to Perth people these beaches are breath taking. Esperance, Lucky Bay, also has friendly wild Kangaroos that come up real close to you on the beach,where else in Australia does that happen? If you are short on time I would skip Brisbane. The cities of Sydney and Melbourne are far superior from a tourism perspective. Hello, we are planning a trip to Australia next year and this website is very helpful! For this 3-week trip, when would be the best time of the year to go? Thanks. Hi Clade. That’s a good question, and there is no easy answer because Australia is so big and the best time to be in one place can be the worst time in another. e.g. you don’t want to be at Uluru and in the Outback in the middle of summer, way too hot. And you don’t want to visit the Great Barrier Reef in summer as it’s the wet season and stinger season (box jelly fish). And winter along the Great Ocean Road and in Melbourne can be terrible weather. So, I would say around May or September, or not in the peak of summer or winter. Hope that helps. Thank you for the quick response. Looking forward to visiting Australia! ? Hey Daniela, happy to hear you will visit Australia and got your questions answered! I like your blog a lot. It is very inspiring and well done. I have never been in Australia but after seeing of your lovely photos in your blog for sure one day I will find free time to go there. Thanks. It was a great article. I am planning for two months business trip in South Melbourne. Would love to visit maximum places during weekends. Will you please suggest a plan for 3-4 weekends ? Thanks. Thinking of bring the family (5 of us, boys 17 and 14, girl 11) to Australia in June/July 2017 – all fantastic swimmers and sports mad and looking for a 2/3 week itinerary. This would be the holiday of a lifetime – last time we’d all be together in all likelihood – so we’re looking to do it all in for €10 K. Flights are c. €3.5 K minimum atm. Is the remaining € 6.5 K realistic to cover EVERYTHING given internal distances and need for flights? Meals / Food. Tickets. Car / 4WD Hire? …and accommodation? I’m working for now on a 4 centre holiday plan on a hub and spoke arrangement – spending 3-5 days in each to minimise the long hauls. I was thinking maybe Perth – Alice Springs – Cairns – Sydney as the preferred order with some flexibility if they really liked one place – can’t see them ever leaving the barrier reef if I’m behind honest! Some of us have red hair (some have no hair *coughs*) so your winter suits just fine. Wife hated Brisbane so apologies in advance that’s just life… I’m sure its a fine city but can’t see it being on our itinerary). If Australia we say the Gateway to the reef is Cairns do we can keep the hoard of tourists away from the best places like, Heron, Lady Elliot and Lady Musgrave islands. Which are nowhere near Cairns. 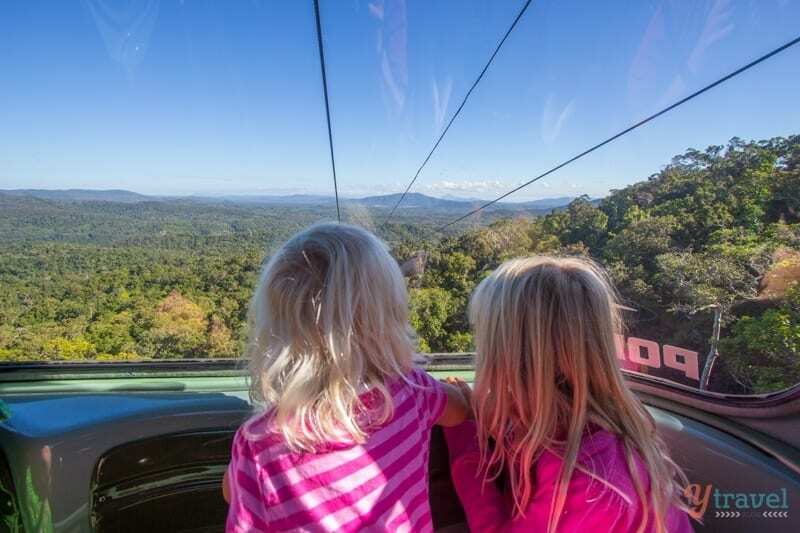 Great write up, but for family adventure you missed Brisbane. You will find attractions like Sea World, Movie World, Dreamworld, Wet and Wild and Outback Spectacular will not find anywhere else. I just finished my 3 week trip to Australia and cannot thank you enough for posting this! I booked the trip 2 days before I flew with my two little kids and planned around all the areas you mentioned. My only comments are: I never found the restaurant you were talking about in Melbourne Chinatown, and thought Sydney’s Chinatown-paddy’s market was much better as far as Chinatowns go. And I enjoyed the sunsets more than the sunrises and would say to do the same sunrise spots but at sunset to catch the sky colors and silhouettes of Uluru, Kata, and Alice Springs Anzar hill. I really would have had no clue what to see in Australia, especially with so little time to plan, this was a lifesaver and we felt like we hit all the good bits! Thank you thank you! Hi Yasmin. So happy to hear you were able to visit Australia and you found this blog post useful for planning your trip. And thanks for the extra suggestions. Great article and route. We would like to know if you recommend doing this route in the reverse order…starting in Melbourne and ending in Sydney? Would it be cheaper or the same cost? And is February a good time to travel? Thank you again. You can definitely do it in reverse. I don’t think the costs would differ in either direction. February is a good time to travel as school will be back in although it is often the hottest time of the year. At least there are plenty of beaches along the way to cool off at! how cool! My dream is to get to know Hyde Park and St. Mary’s Cathedral! What a wonderful sounding trip. My 27 year old daughter and I are coming October/November. This is exactly what we want to see. Her main goal is to swim on the reef. Will this work with the weather. We are very flexible with dates and can easily come at another time. Hi guys, glad you found our itinerary on how to visit Australia useful. November up north on the Great Barrier Reef is summer meaning the wet season and “stinger” season. You can still visit of course and wear “stinger suits”. Best time is actually winter so depends on how flexible you are? My husband and I are planning a trip to Australia maybe in April or May 2018 for about three weeks. Tell me what you think of the following plan: Fly into Sydney and stay 4 nights. Rent a car, drive to Melbourne via the Blue Mountains (probably a 2 night, 3 day trip?). Stay 3 or 4 nights in Melbourne. Fly to Tasmania for 2 nights. Fly to Cairns, for maybe 3 nights then drive down the coast back to Sydney, taking 6 days or so. Is that too much? Is it still the rainy season near the Great Barrier Reef in late April or early May? I think you can do it. Mind you it’s a little rushed and a fair bit of driving. To save on some driving you could simply do a side trip from Sydney to The Blue Mountains, it’s only a 2 hr drive each way, or catch the train from Sydney to Katoomba and back, but would probably be more practical to have a car with you in the Mountains. Then fly from Sydney to Melbourne. 2 nights / one day in Tasmania is quite rushed. Where were you planning on going? And the drive from Cairns to Sydney is LONG and would spend most of your time in the car. Consider skipping either the Blue Mountains or Tassie to free up a few extra days??? Tough I know. Thank you Craig, that was very helpful. You are, no doubt right about the LONG drive from Cairns to Sydney. We may not need to do it, what do you think of the following? We would definitely want to go to Cairns for a few days (right?) for the Great Barrier Reef. We’d also like to spend some time in a small beach town, relaxing, one that we could drive to from Cairns. Then return to Cairns and fly to Sydney. Any ideas? Also, maybe you could suggest an alternate itinerary for us. We do want to see Sydney, Melbourne and the Great Barrier Reef. If we can fit Tasmania in, that would be great. It looks like airfare between Australian cities is not that expensive, so we could fly to save time. Lovely photos! I hope you can also visit Tasmania. Thanks for sharing so much information and suggestions. I loved this post! I am currently planning my trip to Australia for about 3 weeks also, so I will consider all your tips and continue reading your blog for more tips in Australia! Thank you for your detailed itinerary! We are planning our first trip to Australia in July/August with a 3 year old and 7 year old. My sister lives in Perth, so we will spend a few days there. Thinking of doing Perth – Alice Springs – Sydney / Melbourne – Cairns / Great Barrier Reef in 3 weeks and follow much of your itinerary. The Great Ocean Road drive – will it be doable this time of year? Thank you! I love your itemized itinerary!! I have a couple questions though. My husband and kids (22 and 25) are coming to Australia in late December/early January for 3-4 weeks. We are active but also enjoy the beach. Since it sounds like it’s not a good time to go to Alice Springs/Uluru, sounds like we should skip that part. But what will Cairns and GBR be like? If we go there, thinking we would skip the Cape Trib part of itinerary since further north the weather is not good. We would love to do the GBR but if rainy and stinger problem, wondering if that is the best choice. Would it be better to go to Whitsundy area instead….or is that still same problem? We are considering doing a cruise to New Zealand for 12 days from Sydney and then going to Cairns and Melbourne per your itineray. Hi darlings thank you so much for this well written and very informative article. I plan to visit Australia during June or July for roughly 3 weeks. Now, my main concern is that by then, it will be winter there already so it’s highly possible that snorkeling in icy water will have to go. My question is: If I travel during the said period of time, is there any adjustment to be done in your itinerary that i should be aware of? Thanks in advance. You are awesome! Thanks for the great info. We are heading to Australia with our 3 children in a few weeks and we have planned some of the places and experiences you have mentioned here which is reassuring. Do you know of any wildlife sanctuaries/rescue and rehabilitation centers in the Sydney or Cairns areas? I would like my children to observe Australian wildlife, ie. kangaroos, koalas, etc. but as an advocate for animal welfare I am not comfortable taking them to a zoo or wildlife park. I realize these are city center’s and it is unlikely that sanctuaries or rehabilitation centers will be located here but I thought I’d take a shot at asking you. I am having a hard time finding anything online. Thanks! I don’t know of any off the top of my head. I’m sure there would be something close by to Sydney. I know there are a few wildlife parks but I can’t say for sure if they are sanctuaries or rehabilitation centres. I think October will be okay. It will be starting to heat up but not as bad as December to Feb. You will have to wear stinger suits when snorkeling the GBR but that’s not too bad. I am coming to a conference in cairns at the end of August and have 3 weeks . much obliged to you such a great amount for this supreme fascinating and getting travel proposition for a “short” OZ visit. We cherish your reports and websites on OZ. Since we are retired people, we would permit twofold time – in the event that we can bear the cost of it! We’ll need to set aside and unquestionably need to see your lovely nation on the opposite side of the globe sooner rather than later. It is far from us. You are an important “minister” for your Country!! Best welcome from sunny Austria. Am planning to go to the East Coast for three weeks in Jan – Feb 2017, with my two adult children (early 20’s). Of necessity we have to start in Brisbane but plan to finish in Melbourne. Is it reasonable to drive this only, no flights apart from a detour to go to the Great Barrier Reef (assuming we can get there). Also plan to do Fraser Island from Brisbane. Hope to use your suggestions to cover Sydney and Melbourne. Hey Andy, it’s possible over 3 weeks but you will be busy. We followed your itinerary for our trip to Australia. I wanted to say we had great time. You are very organised and detailed. We didn’t skip any of your destinations. We added Adelaide and Brisbane somewhere there and spent fewer days in Cairnes and Red centre. I would focus on Byron Bay area, Gold Coast/ Sunshine Coast, and Fraser Island. Just fantastic this article. I just got married and we are organizing to travel and we were in a lot of air where, but after reading this article we have already decided and already started planning. No fear how to thank for the high quality content. I copied it as several friends who are still married and who are still single. Thank you very much for the tips of the heart. Oh sure! You’ll be fine and have a great time. Stumbled across this article when looking for things to do in oz. Im going next month for 4 weeks (mid feb to mid march). Im starting in Sydney and making my way up the coast towards the great barrier reef. I wont be going to Melbourne sadly but is there anything else i could do instead along the road? Im really into outdoor activity so doing accommodation etc on a budget but i plan spending money on tourist things (i want to snorkel the GBR etc). ???? Hi. maybe a stupid question. How is the driving in Australia? I just came upon your website for the 3 week Australia itinerary. It seems well thought out. I do have a few questions, if you don’t mind. I will be traveling these 3 weeks alone – at the end of december/beginning of January – until i meet up with friends in Melbourne at the end of the trip. 1. Can any parts of the itinerary be done in less time because I am a lone traveler and can do things quicker than those with children? 2. Are there things you would eliminate and substitute other options for a lone traveler? 3. What would be the best way to fit Tazmania in the itinerary? Thank you for this, i already feel less overwhelmed planning for this trip. Very informative article. I am planning a trip for next year. Last week of Feb through first 2 weeks of March. Do you recommend this itinerary for that time of year? I’m concerned about the weather in Cairns and Alice springs. Your thoughts? It will still be very hot in those regions. For Uluru if you get up early to do all your activities it will be fine. Just spend the remainder of the hot day indoors or swimming in the resort pools. At least in Cairns you’ll be near the ocean and the lagoon to cool off. Thank you, very detailed itinerary. Very helpful for someone like me who is traveling to the land down under for the first time. I have one quick question – I plan on traveling to New Zealand in June and Australia in July. Now I know it is winter time while I’m there. Would the weather have any impact on the itinerary. No. It wouldn’t impact it. It’s a great time to visit Cairns and Uluru. It may be colder in some areas to visit but it will be colder in New Zealand! That sounds epic! Confession time: we spent SEVEN weeks in Australia and didn’t manage to see the Red Centre and Uluru. I’d love to go back when the kids are older and it isn’t the absolute hottest time of the year. That said, we saw so many amazing places. 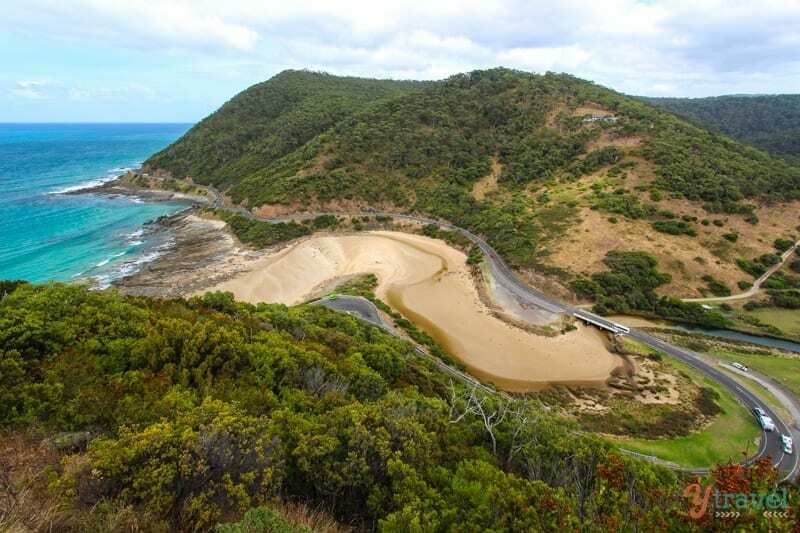 Our favorite was the Sapphire Coast drive from Melbourne to Sydney – stunning and totally empty. About how much money did these 3 weeks cost? How much cost is involved in when you do this itinerary? Not counting the flight to Australia and staying in budget lodging? I really enjoy your blog and this itinerary is just what i was looking for! My friends and i are planning a trip to Australia! Thanks so much for writing this article on traveling Australia because I like Australia very much! Ideally was thinking of doing Gold Coast , cairns , Sydney and Melbourne. We are 4 adults traveling to Australia in Feb 2019. We will have about 2 weeks – what must see would you put on your itinerary? What was your budget for your trip if you don’t mind me asking? Your itinerary for Australia is amazing. Could you please tell me what month of the year did you travel? Thank you for your wonderful blog! Im heading to Australia from US with my 22 year old daughter for the first time for a month, this mid-November to mid-December. We are going to support my Italian brother running an Ironman in Busselton (WA) on December 2. We will meet my brother in Sydney, and fly to Perth on November 29 and then spend 6 days in Western Australia. I’m trying to plan the rest of the trip on the east coast from November 18 to 29, and around Melbourne from Dec 5 to 11, probably skipping Uluru and the Outback due to the hot weather. Should I plan to see Cairns and GBR? Any suggestion to make the most of our time would be appreciated, since the weather may play a big role in regards to the GBR and tropical north. It is hard to make choices because we are forced to be on the Western part of the country for a week and cannot follow your itinerary. Thank You! Good news for you Enrica – the west coast is the best coast!! IT is truly a stunning part of Australia. Most tourists don’t go as it is so remote. Cairns and the GBR are beautiful. I especially love the Daintree Rainforest which is easily accessible from Cairns. It will be hot during that time but won’t be the worst of it as it will just be heading into summer so I think it will be okay up there. Alternatively, you could stay longer in WA and head up to Ningaloo REef, which is more pristine and less touristy than the GBR. It’s also easier to experience as you can walk off the beach directly onto the reef, where as the GBR you have to catch boats to as it is quite far off th shore. You will find all our best Australia tips here https://www.ytravelblog.com/best-australia-travel-tips/ They posts will help you make the decisions as to what to do and see. Have an amazing time!! We are planning a 3/4 week trip to Austarilia from Scotland and we liked your 3 week itinerary looks really good, do you think it’s possible to start in Perth 3/4 days there do the barrier real at that side then continue across to Melbourne do your itinerary but miss out the barrier that side. Yes I think you can. And flying in from Scotland would make it easier to stop in Perth as it’s kinda on the way. Perth is beautiful! I plan to visit australia with my 9 years old kid, in august 2019 for 4 weeks. What kind of itinary will you suggest? We love Australia, we’d like to visit it one day, but it takes at least 3 weeks. Thank you for this wonderful article!